With a long, grey beard and sharp hat, Big H serves me a cold beer in a French tumbler glass. He has a serious question about dub music, whether or not “Randy’s Dub” was really the first ever dub record. I think for a bit, and reply that in my opinion Coxsone’s engineer, Sylvan Morris, was the first to actually record and release what later became known as “dub.” Big H takes in the information, nods gracefully and agrees with my assessment. He thanks me for my opinion and queries if I am hungry as he has made a chicken dish with the good Japanese chicken and not the cheap Brazilian import. He is almost 60, but his eyes have the humor of youth and a rakish sort of mischievousness. We are in his basement bar, Club Open in Shinjiku, which has been celebrating Jamaican music in all of its forms for 16 years. The walls are covered in Jamaican related knick-knacks and paintings, and famous musicians have scrawled their greetings on the much used, tobacco stained walls. In true Japanese fashion, sound is important here, and a whole wall is given over to a stack of speakers that ring out warm tones and deep bass all night long. Big H is a musician, a record collector, a selector of music, a well versed home chef, but perhaps most importantly, he is an enthusiastic champion and supporter of Tokyo’s reggae scene — there is not an ounce of cynicism or boredom in him. Jamaican music changed his life and he has not lost an ounce of love for it nor has his curiosity diminished. This trait shines through in his booking. In New York, I always wished for a reggae-only venue that would be willing to take chances on more obscure concepts on their off nights. Bed Stuy’s Lovers Rock was an answer to that wish and they were always ready to entertain my more off-the-wall suggestions such a night featuring ONLY the Sleng Teng riddim. Club Open operates under a similar vibe. but more geared to roots and conscious reggae. Different nights bring a variety of live bands, singers, Djs and selectors. There is a sense of ownership of the space by both the patrons and the people who spin here – folks help out with the ashtrays, with bussing tables…The selectors and audience seem just as happy and enthusiastic on a slow night with 8 people as a packed night. For the past few months, I have been showing up to an event crafted by Big H called Dub Evening. It takes place on a Monday — known the world over as a slow night for venues — and is a night of strictly dub music. This means the “version” side, the dub LP cuts, the extended disco-mix lunacy of particularly fearsome 12″. I have played there a few times and thought I could get away with an obscure instrumental cut (Roland Alphonso’s Ethiopian War to be exact) but it didn’t get by Big H’s seasoned ears — I was chided for breaking the format and given a shot of tequila to get me back on track. It is not a night for everyone, but the perfect night for me. I have heard enough regular reggae tunes to last a lifetime, and I love hearing what obscurities the other selectors will come up with. In its devotion to an idea, a musical concept, it is a night that reflects Big H’s uncompromising stance towards the music and culture he loves. 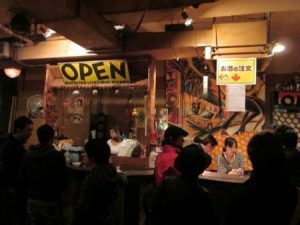 It may not be the road to riches, but Club Open has created a real community (within the general Tokyo reggae community) of like-minded souls. I have befriended a number of regulars — a Buddhist monk, deeply versed in reggae, who has taken it upon himself to share with me some of the best food I have eaten in Tokyo; a middle-aged man who comes in after work dressed in the ubiquitous and anonymous salary-man-suit who, when holding a microphone, reveals a deep knowledge of patois and vintage 1980s Deejay style; a next guy, a salesman, whose work has taken him all over Japan and has made it his private goal to go to each and every reggae related bar in the entire country. Not to mention Big H himself, who I feel a familiarity with as though he were an old friend who moved to Tokyo when we were in college. I feel lucky that Club Open is there for me. Moving to Tokyo has been a massive change, and no matter how wonderful I have found it, it has left me a bit off-center. Without language or a true understanding of the culture, or old friends for that matter, I often feel un-tethered, an invisible orb riding the crest of barely deciphered sound. On a bad day, I feel like I could walk through wet concrete and never leave a heel print. And yet, I could step into Club Open at any time, and feel suddenly grounded. Reggae music has been my constant companion for going on thirty years and I feel my love for the music reflected by Big H and the patrons of Club Open. It isn’t that it feels like Brooklyn, or Jamaica for that matter; quite the opposite, it feels precisely like Tokyo, but a space where my shared language has a nuance that I have yet to reach in my day-to-day life. For that I am deeply grateful.